If you are in search of Oracle Off Campus 2019 Drive? then you have visited the exact website. Oracle is now hiring a huge number of fresher candidates across India mainly in Hyderabad, Chennai, Bangalore, Mysore, Cochin, Maharastra, Mumbai, Delhi, Coimbatore, etc. Furthermore, the Oracle representatives are now providing the Oracle Off Campus Recruitment 2019 for all the 2018, 2019 passouts. This page is made for the candidates who are willing to apply for Oracle Off Campus 2019 Drive. Furthermore, at the below sections, we have equipped the useful information like eligibility criteria, Selection process, requirement process, salary details, online registration, etc. Surely, this is a good opportunity for job hunters. And, Oracle is now looking forward to the talented as well as skilled candidates. Aspirants who are willing to join this company have to meet the details and specifications given below. In addition to this many candidates who are willing to attend the Oracle Off Campus 2019 Drive can now apply through Oracle Recruitment Process. The online registration link is attached at the below. As we know that Oracle is conducting drive all across India there will be tough competition to get selected in the company. Furthermore, Oracle Recruitment Team is now looking for the efficient and talented contenders across India. Hence, people have to prepare well by downloading the Placement papers and also by attempting the online written tests. However, many of the students had done their registration process. Even though you apply for the job without practice you cannot attain any job. Therefore the aspirants who meet the specifications can now apply for Oracle Off Campus 2019 through the link given below. On the other hand, the contenders who are willing to join the company has to put a lot more efforts to be get selected in the company. Furthermore, our website also provides you with the placement papers and the registration links. Therefore, we suggest you download those pdf and prepare well for the Oracle Recruitment Process as the competition is gone to be tough as it is held all over across India. The Oracle is an American multinational corporation, headquartered in Redwood Shores, California. The company specializes primarily in developing and marketing database software and technology, cloud engineered systems and enterprise software products particularly its own brands of database management systems. In 2015, Oracle was the second-largest software maker by revenue, after Microsoft. Moreover, the company also develops and builds tools for database development and systems of middle-tier software, enterprise resource planning (ERP) software, customer relationship management (CRM) software and supply chain management (SCM) software. The Oracle Career race designs manufacture and sell both software and hardware products. Therefore, Oracle also offers services like financing, training, consulting, and hosting services. Oracle Provides Unity in Diversity nature of the workforce. And, it helps in developing your skill set and extravagant activities. It teaches you how to solve customer problems with great solutions. So, what are you waiting for? be the next great hire. Therefore, we suggest you to register through the registration links given below. To find the registration link you need see the bottom of the page. Oracle is a reputed company and one of the topmost MNC’s we have ever heard. So, they cannot just take in any person and make them work. To attend the Oracle Off Campus Recruitment 2019 drive one needs to meet the eligibility criteria given below. 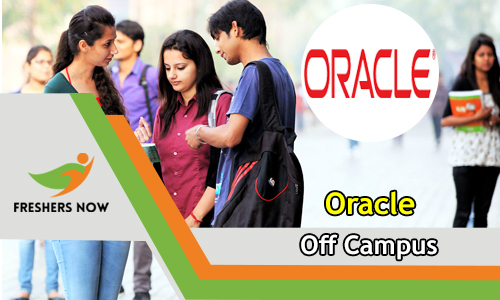 MCA with B.Sc/ B.A/ BCA/ B.Com is also eligible for Oracle off Campus Drive. Students who are secured with 60% and above in their academic profiles in 10th standard, Intermediate, and B.E/ B.Tech are eligible for Oracle off Campus Drive. Therefore the students should meet the marks criteria given below to attend the Oracle Recruitment Process. B.E/ B.Tech/ B.Com and other Graduates and Postgraduates should have a minimum of 60% in their academic career. No backlogs are allowed. In the case of, backlogs the company will be rejecting the students profile. Therefore, we suggest you clear the backlogs before joining the company. Should be Attentive and Spontaneous. Thereupon, Oracle is one of the most leading computer Technological Companies. So, getting a job in such company is a challenging issue. The contenders should be aware of the rounds conducted during the Oracle Recruitment Process. Therefore the rounds conducted in the Oracle Off Campus Recruitment Drive are given below. The written test consists of Verbal ability, Essay writing and also Coding. So, one is through with all these rounds and questions asked in the interview. Original ID Proofs like (Aadhaar card, PAN Card, Id Card, Ration Card, Passport, Driving Licence, etc). You need to check the official website @ www.oracle.com. Next, you need to click on the following. Oracle home -> Careers -> Job Search. Next, you will find some empty particulars given below. Job Title, Job Shift, Job Location, Job Schedule, Job Type, Job field, etc. Therefore, we hope the information provided was helpful. So, we suggest you not to miss the golden opportunity. Find your career growth by applying for Oracle Off Campus Recruitment 2019 Drive for Freshers, Online Registration through our website freshersnow.com. Stay tuned! for more updates.